ShockYa.com and a few other journalists got the fantastic opportunity to speak with Bruce Campbell about being able to act alongside Lee Majors and an upcoming fight scene in season 2 that may possibly sicken some viewers at home. So is there more pressure on you going into this season? Bruce Campbell: Yes, because of expectations. If we get through season 2 alive then we’re good. I had a bold prediction; this is the season that it sticks, because you’ve put a show out on the air and it takes a long time to get around the world. There’s selling this around the whole world, and it takes a long time to get there. Season 2 comes out and people go I think I’ve heard of that show, they check it out, and the more you see it, the more it becomes real in your head. Like if Starz were to give us a season 3 now, people would go oh, this is a real show. Oh well I’ll start watching it then, that it’s worth investing your time in. Cause sometimes you just go well I don’t know how long the show is going to last, so why should I watch it? Plus, you know people have a list of what they’re binging, and you have to allow for them to get to your show. We might be in a queue of three, four, five other shows that they’ll get to us, but not right now. So all these networks have to learn how to check the ratings. No one is sitting there live on a Tuesday at 8 ‘o clock anymore, nobody. And half of you bozos don’t even have cable. You’re all untethered, so Starz put out the app recently, $8.99 whatever the hell it is that they get out of you a month they get it all. So they’re getting with the program. The trick is that they’ve gotta stay up with this speed of you people to stay current with how they — look, I want what I want on my device and I want it now, and I want it on this device and I want it on that device. I want to be able to put it on my TV, so they’re not there yet but they’re getting really close. So with season 2, you’ve got Lee Majors as your father. 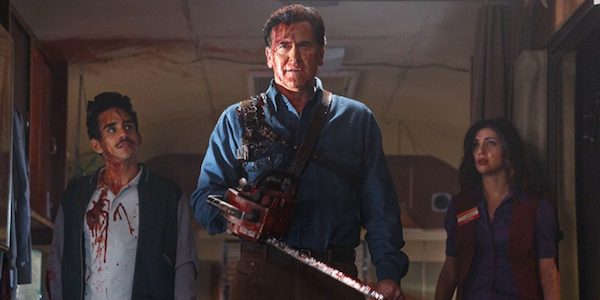 Bruce Campbell: Game over. Write the check. Check please!